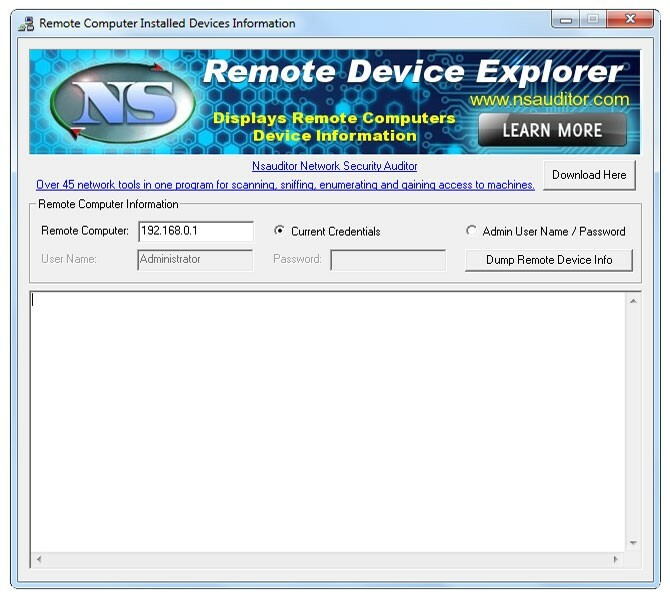 RemoteDeviceExplorer 1.0 is remote computing software developed by Nsasoft LLC.. Remote Device Explorer displays device information installed on remote network computer and enumerates the members of the specified device information set. You must have administrative privileges on the remote network computer. All the mentioned features are provided with a user friendly graphical interface. This network & internet program is freeware, so you can download and use it absolutely free. RemoteDeviceExplorer 1.0 supports different languages (including English). It works with Windows XP/Vista. We have tested RemoteDeviceExplorer 1.0 for spyware and adware modules. The software is absolutely safe to install. We has completely tested remote computing software RemoteDeviceExplorer 1.0 many times, written and published the interesting article and uploaded installation file (432K) to our fast server. Downloading RemoteDeviceExplorer 1.0 will take several seconds if you use fast ADSL connection. Displays information associated with each process running on remote computer. InterMapper Remote provides a remote view on your network.